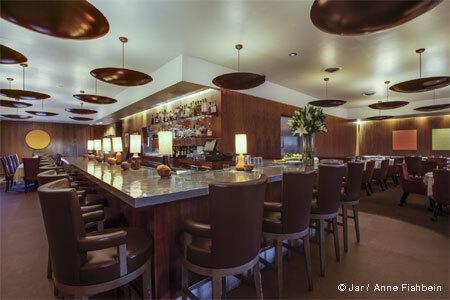 Swank downtown restaurant-lounge with Modern American cuisine, a DJ-enhanced ambience and a worldly wine list. 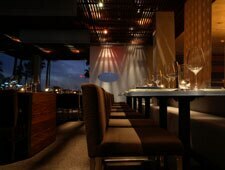 : The drop dead gorgeous views---a fresh look at Downtown, including L.A. Live---are just the beginning at Blue Velvet. Though noted opening chef Kris Morningstar has long since departed, the menu of Modern American cuisine remains under executive chef Jonathan McDowell, who formerly served as Morningstar's sous chef. A generous list of small plates is available, which is a good match for the seductive list of cocktails offered from the bar. Charcuterie and artisan cheese plates, pistachio falafels, and hamachi sashimi with applesauce pair well with a Thai basil lemon drop or pear martini. In the entrée category, options we like include Scottish salmon with white bean ragoût, and a hanger steak with onion rings. A rooftop herb garden that cools the building and reduces the restaurant’s carbon footprint is a nod to eco-conscious diners. The stylish modernist design of this lounge and restaurant includes a co-ed bathroom, with its central island of automatic sinks surrounded by opaque glass-fronted stalls. There’s more communal space in the lounge in the form of a sunken granite table where you share space with strangers, sip cocktails and order from a separate bar menu. The small wine list is a work in progress, yet global in scope and reasonably priced; a “reserve” list holds expensive bottles better suited to the business crowd that sometimes drifts in from Downtown than the young trendsetters who more often frequent the place.